Sorry, another short and sweet post as I'm too busy for a long one! Kanada Satoshi and Nakada Kurumi returned as presenters once again, this time joined by producer Kobayashi 'KobaP' Hiroyuki and seiyuu Ookawa Tooru (Tokugawa Ieyasu). After the usual greetings, Ookawa took the reins and tried out Ieyasu on Mitsunari's Battle of Sekigahara: Western Shadow stage. Ookawa (as Ieyasu and Tadakatsu) fought Sakon, Yukimura and Gyoubu before it was time to face Mitsunari. The confrontation with Yukimura led to the short scene where Ieyasu catches one of Yukimura's spears, as seen in previous footage. 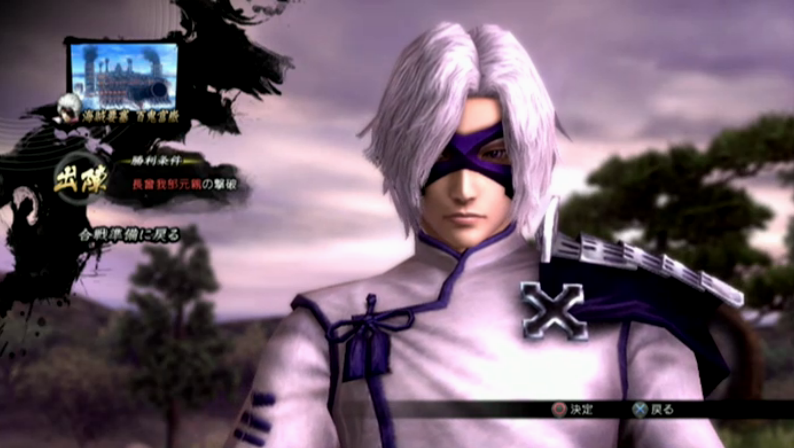 When Gyoubu was defeated, Mitsunari began yelling even more crazily than he does in Sengoku Basara 3. 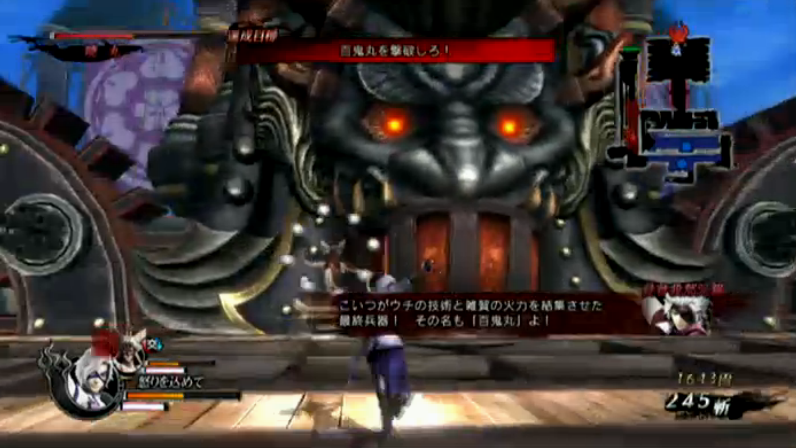 Along the way Ookawa also unleashed Ieyasu's Giga Basara attack, giving us a good look at it for the first time. 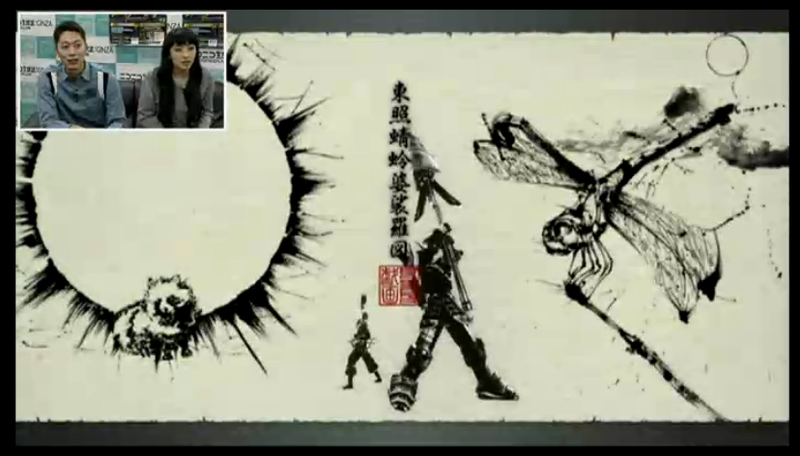 Ieyasu's two-character title is 東照 (Toushou - one of his titles meaning 'Light of the East') and his Basara-e illustration is a tanuki with a sun behind it. 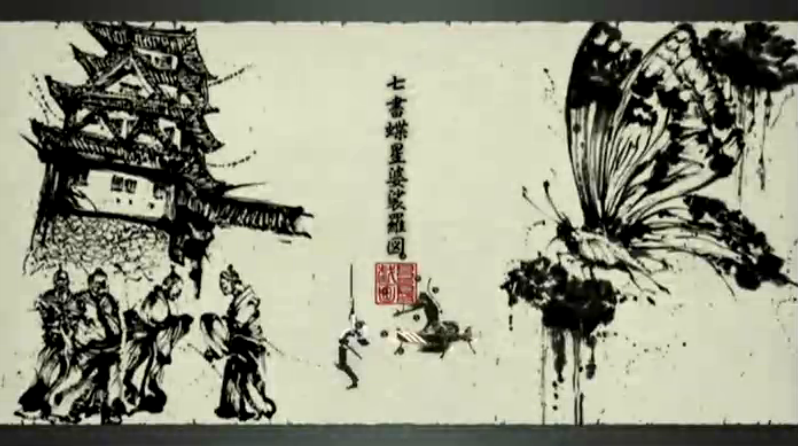 Tadakatsu's two-character title is 蜻蛉 ('dragonfly'), as is his picture. 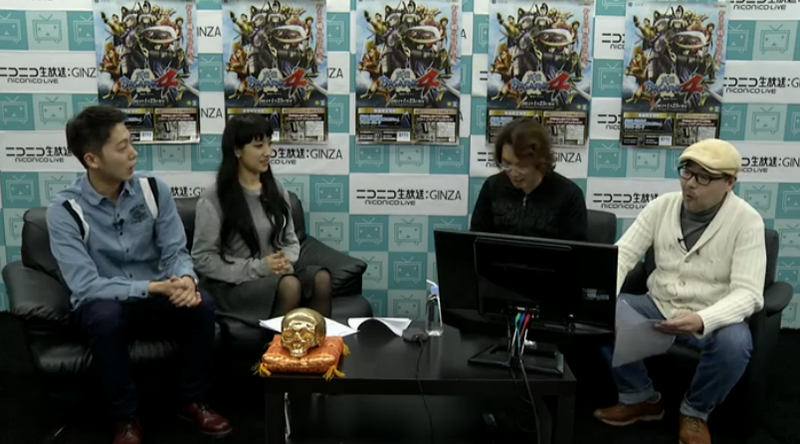 After Ookawa's segment, KobaP joined Dogma Kazami and Aoki Shiki (Maou) for the two challenges. All they had to do this time was beat the level within 15 minutes. 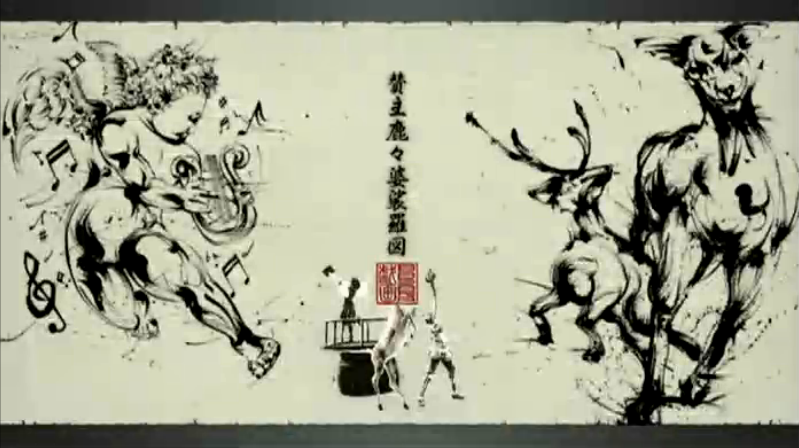 The first challenge was Hanbee (and Gyoubu) on Aniki's Pirate Fortress: Hyakki Fugaku stage. We got a nice, clear look at their Giga Basara artwork with Gyoubu's 蝶星 'butterfly star'. Near the end, Aniki's Akatsukimaru transformed into the colossal Hyakkimaru - it was very cool. The second challenge took place on Kingo's Bizen: Ujou stage. Shikanosuke had to chase him down for the first half while he kept sneaking into quiet corners and supping on his nabe. After a fight with Tenkai later on, the player is required to accrue salt, miso or soy flavours according to the request on screen. The flavour bars and the pots the enemies carry are colour-coded so it doesn't look too difficult. We were also treated to Sourin's Giga Basara artwork. It's a cherub playing a harp, and his title is 賛主 ('Lord of Praise'). The final announcement was that a group of three girls called the 'Basara-bu Otomegumi' (Basara Club: Maiden Team) will be making updates for the official Sengoku Basara 4 website each Friday starting from tomorrow. I found this segment less interesting than the rest (it didn't help that most of the comments on the Nico Nico stream were discussing the size of the girls' breasts). 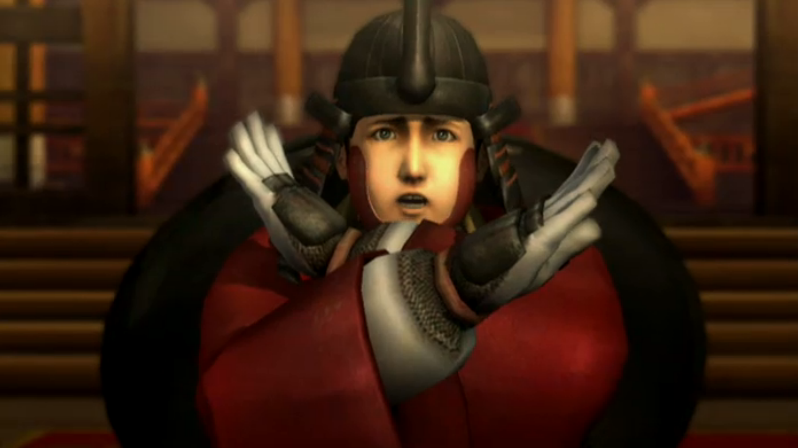 Next fortnight's episode will be on the day that Sengoku Basara 4 is finally released! Okamoto Nobuhiko (Shibata Katsuie) will be the seiyuu guest and freelance writer Mafia Kajita should also be appearing. You can book a timeshift for the next episode on this page. A few details have surfaced about the official strategy guide that Manga Oh was listing a while ago. e-Capcom has now listed it too and given it a proper name: the Sengoku Basara 4 Sengoku Sousei Eiyuutan Dramatic Heroes Guide. It will be in the V Jump line again. The Pasela chain of karaoke establishments will be offering special Sengoku Basara 4 dishes and drinks once again. Customers who order the tie-in items will receive a randomly-selected character pin badge. HAHA I managed to watch it for once!! And Sorin gets an Asian style cherub. But of course! Holy moly Aniki’s suddenly upgraded demon warmachine, that was some Devil may cry-like stuff. Kingo has really levelled up, his own soldiers didn’t respect him in SB3 but now he is like a master of a giant cooking castle? I hope, when nice people translate the menus and such, that they can also translate the stage missions. I had no idea what was going on with Kingo's guys there but it was while watching a crappy quality broadcast, after all. Congrats on watching it in real time :D the timing is always really annoying for these things. That's a good point about the stage objectives. If I find some time and they aren't already done by someone else I should include that information too - though it will mean reformatting my table, d'oh! There seem to be a lot of quirky gimmicks this time to make each stage feel different. Sry for being off topic, you'll be disappointed with Pupa. RLY DISAPPOINTED.